Cooking – it's the sort of thing that's fun when you have free time and a royal pain in the proverbial when time is of the essence. Learn this very simple cooking technique, with plenty of creative options for variety, and create finger-licking, no-fuss, one-pan dinners – with very little washing up! Method: Remove fat from chicken. This is optional, though recommended for health reasons. Add oil to a large pan. When hot add the chicken and garlic. Sear the chicken and take care not to burn the garlic. Add salt, pepper, dried oregano rubbed from the branch, veggies of choice, and around 1 centimetre of water. (Leave any delicate veggies for adding later). Lower the heat to a simmer and pop on a tight-fitting lid for maximum flavour melding. Check occasionally, turning chicken over and adding more water if necessary to avoid sticking or burning. You do want to end up with some tasty pan juices so keep it wet. Spoon some pan juices over the veggies. Long, slow cooking is best. Serve when chicken is tender. Optional: toss cooked noodles or rice into remaining pan juices and serve alongside, or serve with a couple of thick slabs of bread for mopping up juices. -	If using a fast-cooking meat, cut veggies into smaller pieces. If doing a very long, slow cook (such as the 3 hours recommended for lamb shanks, add veggies after about 2 hours or end up with a mushy mess. 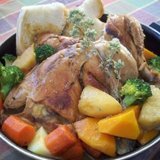 -	You can pre-cook the meat in advance and refrigerate or freeze it, together with juices, pulling out when required, defrosting and finishing in the pan with vegetables. For chicken wings, replace oregano with honey and soy, ensuring you keep an eye on water levels to avoid burning when the sugars in the honey caramelise. This licky, sticky variation also works very well with other chicken cuts, pork, beef, and lamb cuts. Other flavour variations include plum sauce; or apricot nectar and soy with chicken/pork; or honey, garlic and rosemary with lamb. For more ideas on what goes with what, just go to the Taste website, search your preferred meat and experiment with some flavour combinations. Get creative! Why? Because meat ‘n’ 3 veg never tasted so good.